The Huskie Hack – NIU’s annual 24-hour hackathon – is being revamped this year. The revitalized hack now offers more opportunities for NIU student mentors to gain project management experience as they work with teams of high school students who are harnessing the power of today’s technology to make positive change in the world. The Hack, which will take place on Saturday, Feb. 23 – Sunday, Feb. 24, in the Holmes Student Center, brings together aspiring computer coders, social activists and designers. Team members will collaborate to develop original tech solutions to pressing problems affecting young people today. Participants in the fall 2017 Huskie Hack developed tech solutions to health and wellness challenges. 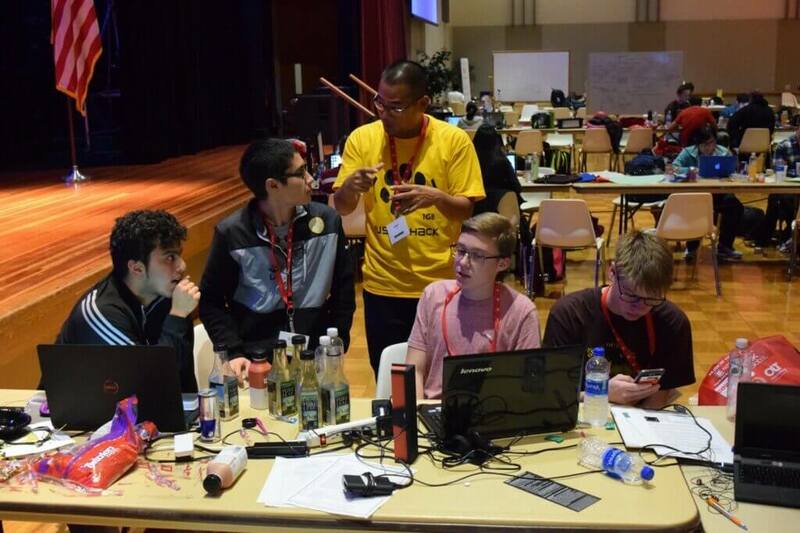 “The hackathon is a great opportunity for NIU students to give back to the community and expand their own skill set,” says Kate Powers, a STEM educator for NIU STEAM and the Hack organizer. Powers says the Hack particularly needs student mentors with expertise in computer coding, design or social activism. Each mentor will be paired with a high school team for the full 24-hour period. NIU students, faculty, community members or alumni who would like to volunteer for the Hack should visit Go.niu.edu/HuskieHack and click on “Help Our Hackers” to register. What is a hackathon, anyway? “A hackathon is an event with many variations,” says Powers, “but it is usually a multi-day event that brings together computer enthusiasts, programmers, coders, designers and subject matter experts to quickly design a software solution to a stated problem.” Hackathons offer an educational opportunity for students to get hands-on experience designing software while working with teammates from various backgrounds. After the set time, the teams present their hacks to a panel of judges, and the best hacks are awarded prizes. This year’s social-activism challenges will ask students to develop tech solutions to pressing problems affecting young people in today’s world. The challenge details will be released during the week leading up to the Hack. The student participants will have a chance to practice hands-on software development, work with large data sets, network with representatives from companies who hire computer coders, and meet college students who study computer science, design and technology. They’ll also be able to attend workshops on various aspects of computer programming and social activism related to the Hack theme. With questions or to register, visit Go.niu.edu/HuskieHack.